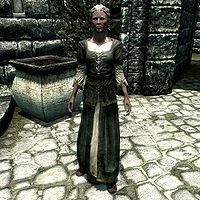 Alexia Vici is an elderly Imperial citizen. She is only present during the wedding of her daughter, Vittoria Vici. She is also the aunt of Emperor Titus Mede II. Alexia Vici wears a set of farm clothes along with a pair of boots. She is clearly unhappy with her daughter's marriage, as she can be found saying, "What my daughter sees in that... barbarian, I'll never know." and "The thought of paying a dowry to that, that... Stormcloak turns my stomach." Additionally, she may tell you, "My nephew, the Emperor. Too busy to attend the wedding of his beloved cousin. We won't stand for this slight, I assure you." If you ask her if she is having a good time during the wedding, she will respond, "I most certainly am not. I've just lost my daughter to a Nord beast, and my nephew Titus is too busy playing Emperor to even show up." When Vittoria Vici dies, Alexia can be found screaming, "My daughter! Dead! Noooooo!" This page was last modified on 28 October 2013, at 11:03.